Pull&Bear Shorts first surfaced on Chictopia's streetstyle gallery in Fall 2010 seen on Novara blogger ncolettausa of scentofobsession.com. She wore her gold pull&bear shorts with a beige Steve Madden shoes, yellow pretportobello jacket, and brown Miu Miu bag. Since then, Pull&Bear Shorts have grown in popularity as bloggers from Madrid, Mexico City, and Paris have discovered them. Pull&Bear Shorts are generally seen in casual, chic, and comfortable style. Popular types of Pull&Bear Shorts are floral, lace, jeans, high waisted, and denim shorts. Blogger's favorite colors are black, blue, navy, and sky blue. There are currently 360 streetstyle photos of bloggers wearing Pull&Bear Shorts. 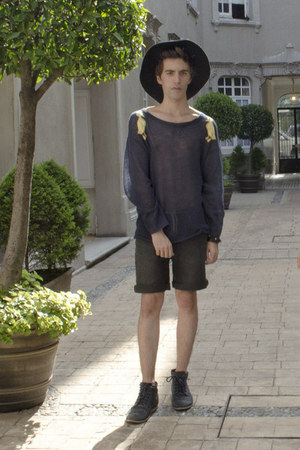 Most recently, blogger HenEvia of henevia.com styled his pull&bear shorts with a Zara hat, Top Ten 10 sweatshirt, and Bimba & Lola sneakers.